Many physiological functions in horses are influenced by body condition including the horse's maintenance, reproductive and exercising requirements. Prior to 1983, no universal way to assess and communicate body condition was available. 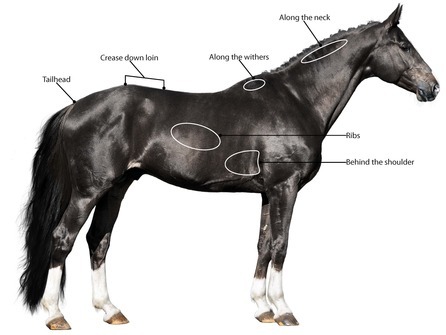 This body scoring system is a helpful management tool that can be used with all breeds of horses. By evaluating the relationship of body fat to body musculature, a horse owner can determine the body score of a particular horse. This body scoring system is a helpful management tool that can be used with all breeds of horses. Once the relationship of body fat to body musculature is determined, the nine point scale developed by Dr. Henneke gives the horse owner a valid way to analyze a horse's condition as a guide to nutrition, reproductive capability, performance ability and health. Maintaining an ideal weight is not always easy. Some horses are "easy keepers." and require minimal calories to maintain optimal body condition. Ponies, in particular, seem to store excess energy as fat. Many adult horses, especially those in their middle years. begin to retain unneeded weight due to reduced activity and a slow-down in metabolism. When weight gain becomes extreme, the horse is classified as obese. Evaluating the relationship of body fat to body musculature helps a horse owner determine the body score of a particular horse and is a helpful management tool that can be used with all breeds of horses. 6. Behind the shoulder at the girth. Scores range from 1-9, from poor to extremely fat. According to the AAEP and veterinarians, for most horses, body condition scores in the moderate to moderately fleshy range of 5 and 6 are ideal. A common suggestion is to keep your horse where you can feel the divisions between the ribs, but not see them. 1 Poor Horse is extremely emaciated. Backbone, ribs, tailhead and hipbones are prominent. Bone structure of withers, shoulders and neck are noticeable. No fatty tissue can be felt. 2 Very Thin Horse is emaciated with slight fat covering over vertebrae. Backbone, ribs, tailhead and hipbones are prominent. Withers, shoulders and neck structures faintly discernible. 3 Thin Fat built up about halfway on vertebrae. Slight fat layer can be felt over ribs, but ribs easily discernable. Tailhead is evident, but individual vertebrae cannot be seen. Hipbones cannot be seen, but withers, shoulder and neck accentuated. 4 Moderately Thin Negative crease along back. Fait outline of ribs can be seen. Fat can be felt along tailhead. Hip bones cannot be seen. Withers, neck and shoulders not obviously thin. 5 Moderate Back is level. Ribs can be felt, but not easily seen. Fat around tailhead beginning to feel spongy. 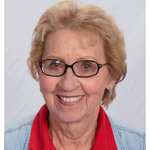 Withers are rounded and shoulders and neck blend smoothly into body. 6 Moderately Fleshy Horse may have slight crease down the back. Soft fat can be felt on the tailhead. Fat over ribs is spongy. Slight fat deposit can be felt along the sides of the withers, behind the shoulder and along the neck. 7 Fleshy A crease is seen down the back. Individual ribs can be felt, but noticeable filling between ribs with fat. Fat around tailhead is soft. Noticeable fat is deposited along the withers, behind the shoulders and along the neck. 8 Fat Crease down back is prominent. Ribs are difficult to feel due to fat between them. Fat around tailhead very soft. Area along withers filled with fat. Area behind shoulders filled in flush with barrel of body. Noticeable thickening of neck. Fat deposited along the inner buttocks. 9 Extremely Fat Obvious crease down back. Fat can be felt in patches over rib area with bulging fat over tailhead, withers, neck and behind shoulders. Fat long inner buttocks may rub together. Flank is filled in flush with barrel of body. The job or workload of a particular horse also has a bearing on what weight is appropriate for maximum performance. Polo, race and endurance horses might be perfectly fit with body condition scores of 4 or moderately thin, while a body condition score of 7, fleshy, may be required for success in the show ring. However, by feeding a horse to a level of 8, the limits of good health are being pushed. Horses with scores of 8 and 9 are definite candidates for a weight reduction plan. Our Barn Guide to Body Scoring is a great resource to print and take with you to the barn. 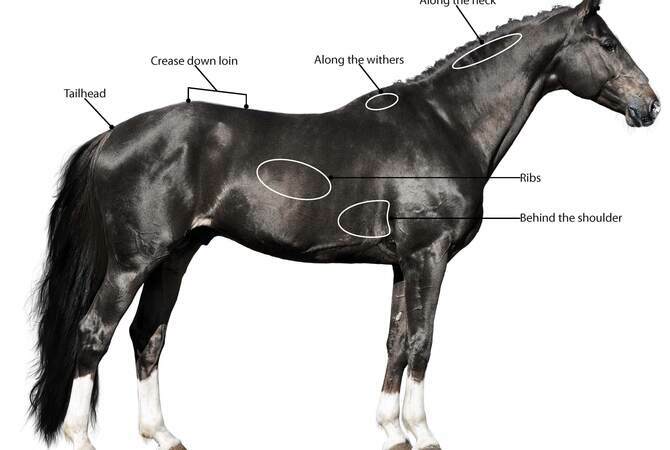 Use it to establish a body score for your horses. You can also learn more about horse nutrition by visiting our Nutrition Health Center.